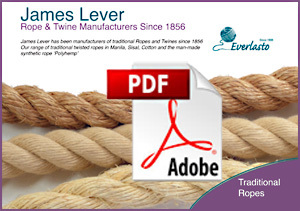 James Lever rope and twine manufacturers are suppliers of high quality three strand synthetic hemp rope in diameters of 4 to 32mm. Polyhemp rope is a weatherproof rope that will not shrink in length or expand in diameter when wet. As it is made from polypropylene it has the hard wearing qualities of a synthetic rope whilst retaining the look and feel of a natural hemp rope. These characteristics make it ideal for outdoor use and it is extremely popular for use as a decking rope, with children’s play areas and in general landscaping. Our polyhemp rope range is available in diameters of 4 to 32mm.